The only explanation i've ever heard for the crescent stepping (other than just being able to generally move in various ways) comes from George Mattson's "The Way of Karate" where he states that it represents protecting the groin as you move into the opponent's range. Any other explanations? Surely there's more to it than that..? My answer is: not really. To my mind, the crescent step is the way one should perform basic ayumi ashi (natural stepping) when there is no initial lunge with the front foot (more on this in a minute). This is primarily so as to protect your groin (which the crescent step achieves by bringing your knees together during the step). There is very little "time loss" because the arc drawn by your knee inwards does not significantly alter the path taken by your hip. So crescent stepping is quite useful for general movement because it is inherently protective of your most delicate regions without overly compromising speed and mobility. Basic "ayumi ashi" (natural stepping) as practised in many karate schools. Note the crescent stepping (ie. the knees coming together). Now it is true that the crescent step is slightly slower than a straight step. But if speed in stepping is imperative, you should be utlising a lunge (hence my original point) - not a natural step. In other words, you should either lunge (oi ashi) or lunge and step (suri ashi or yori ashi). Because, as I've pointed out before, when you move your front leg (as opposed to your back leg) you instantly exert pressure on your opponent. In other words, the moment you raise your front leg, you are exerting pressure. However when you move your back leg, you only exert pressure on your opponent when your back leg crosses the mid-line of your body. When you lunge, then step so that your back leg moves to the front (suri ashi), you are generally closing the gap. This in turn means that the point at which you might have done a crescent step would have been well out of range. Accordingly there is no need to do a crescent step when you are performing the initial lunge or the follow-up step. 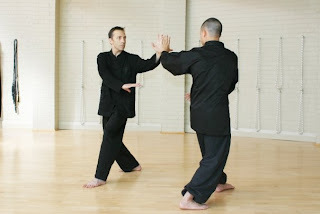 Suri ashi - a kind of stepping where you lunge, then step, with your back leg passing the front. When you are simply lunging (oi ashi) or lunge stepping so that back leg never passes (yori ashi), crescent stepping is not really possible and it is therefore not an issue. Yori ashi - a kind of stepping where you lunge, then bring your back leg up without it passing the front. Otherwise, in normal stepping (ayumi ashi) you should always do a crescent step (unless you want to invite a kick to the groin!). Now just because an art might require the practice of crescent stepping doesn't imply that the art's tactics centre on that kind of stepping. In any art, correct positioning and timing can (and should) negate the need for a crescent step in combat. After all, this is precisely why such a step is unnecessary with a lunging step - the positioning and timing make it a non-issue. The lunge example relates primarily to range. But clearly angle can also negate the need for crescent stepping. The Chinese internal art of baguazhang uses this principle and avoids any need for crescent steps. This just highlights that crescent stepping is very much part of kihon (basics): it assumes linear, natural stepping (ayumi ashi) that is in line with your opponent's centre. While it might be tactically inadvisable to be in line with your opponent's centre, kihon is often about what to do when things go wrong or don't go exactly to plan. It is for this reason that karate systems like goju (and shotokan) use crescent stepping in their basic training. In other words, they don't rely on (or even envisage) the tactic of being lined up with the opponent's centre, but rather they teach certain basic movements as skills for coping with being in an "unforgiving" position (to which beginners are somewhat prone). 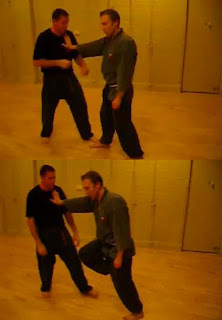 Otherwise, standard goju tactics involve being to the side of your opponent's centre, while shotokan tactics often involve being well out of danger in a linear sense. Can crescent stepping be useful for other purposes or fulfill other objectives? Sure. For one thing, it helps avoid the clashing of knees when moving into an opponent. It is also possible to use crescent stepping to unbalance your opponent (eg. by applying pressure to the side of your opponent's thigh - either on the inside or outside). However I don't think these are the reasons behind the use of crescent stepping in karate and some other arts. They are just side-benefits and possible applications. Nor do I think crescent stepping is some kind of "code" to preserve the "five feet" (ie. a means of indicating 5 different optional movements when stepping, namely: moving forward, backward, sideways, around and lifting the knee). In my view you don't need a "code" for such things in kata and even if you did the crescent step isn't a particularly representative of the various options (any more than a normal step would be). So in the end, I think crescent stepping is primarily a means to avoid exposing your groin in natural stepping. It's that simple. It's exceeingly useful to see the different types of stepping. Thanks Mohammad. I filmed these stepping videos as a resource for my students, so I'm glad to hear you say that they are useful.